Home decor styles are constantly changing, whether it's because of designers and architects or even the diverse needs of the people living in them. A modern home is more than just a place to rest your head, it's a reflection of the person living inside it. 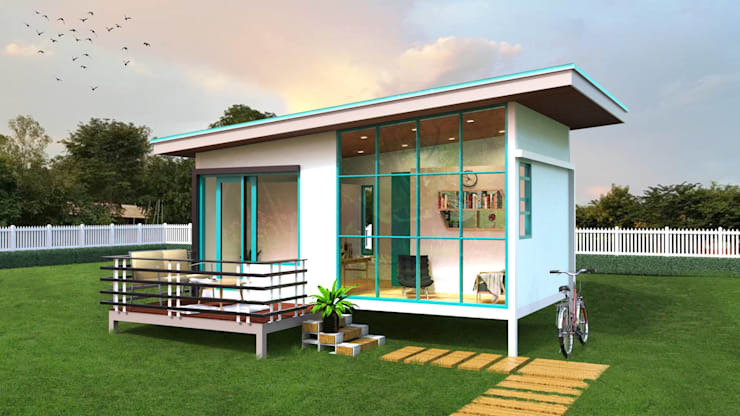 And one such modern home style are bungalow houses. Why choose a bungalow-style home? In earlier times, bungalows were built for the purpose of renting them out. 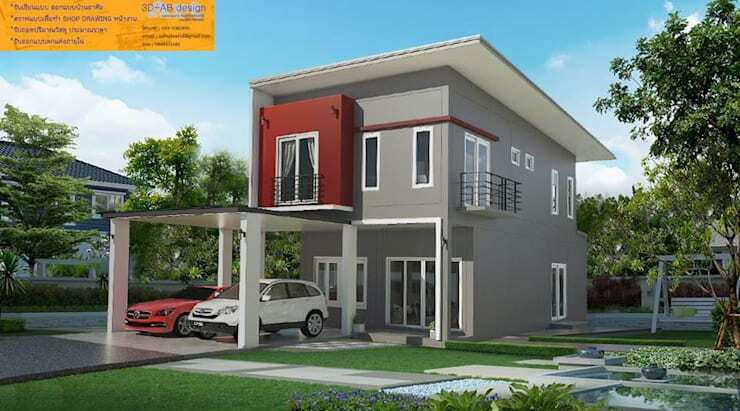 But nowadays, this distinctive style has been adapted into the go-to modern home design due in part of its simplicity, beauty and economical pricing. 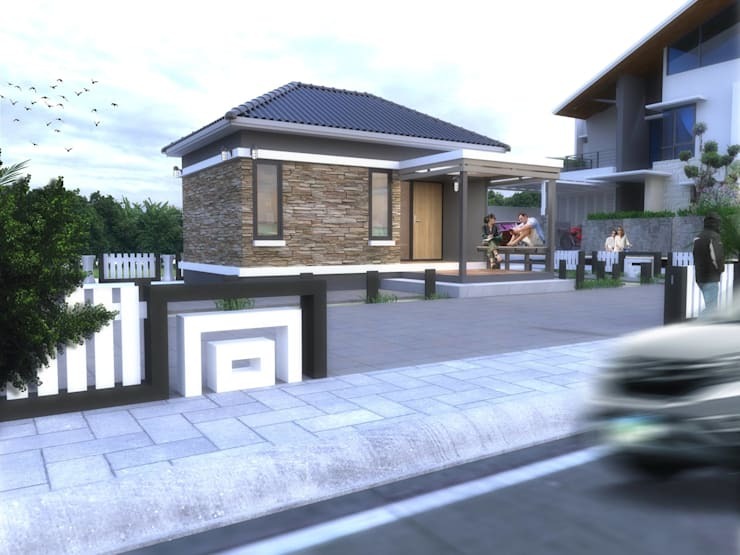 Most bungalow-style homes are built as a single storey structure that emphasizes casual design, versatility and wide usable spaces without focusing too much on individual furniture. The key is linking each corner of the room to practical utility. On the outside, the garage is designed for ease of travel while a green space is also built for relaxation. Today, Homify is pleased to present a variety of creative bungalow-style home designs and ideas that will either help inspire you to create your own or to adapt the style of your home. 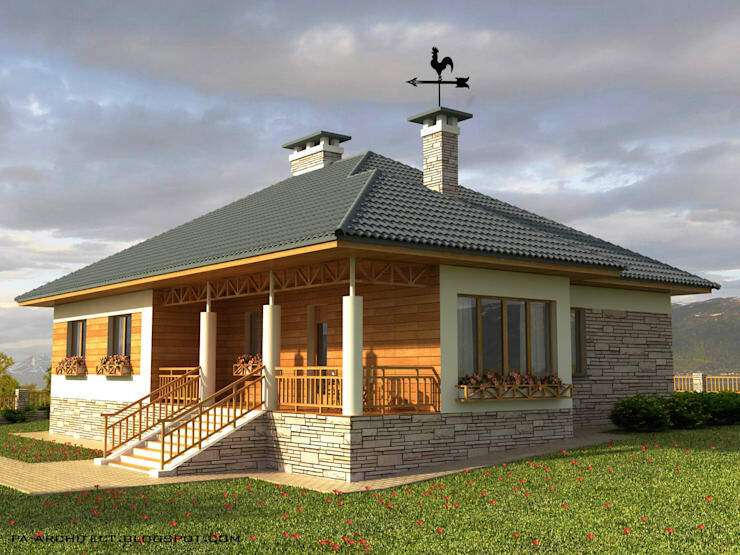 Single storey bungalow houses focuses on beautiful designs that incorporate natural materials like brick and stone throughout structure. From the driveway and paved walkways to the outdoor flooring the stones bring a welcome contrast to the wooden patio walls, floors and stairs. The materials are outstandingly strong and durable, but most of all, aesthetically pleasing as each material brings a unique and warm hue that helps it blend in with nature. As you can see, the roof is designed with high ceilings, which shows that the interior of the house was designed to create a clear and airy space intended to make the rooms more inviting and comfortable. The doors and windows are also decorated with clear glass to help bring in natural light that help make the atmosphere of the living space even more relaxing. The outdoor space is also decorated with a lush garden with grass to create a multi-purpose courtyard where you can sit and relax, enjoy outdoor activities like exercising or entertain your guests. 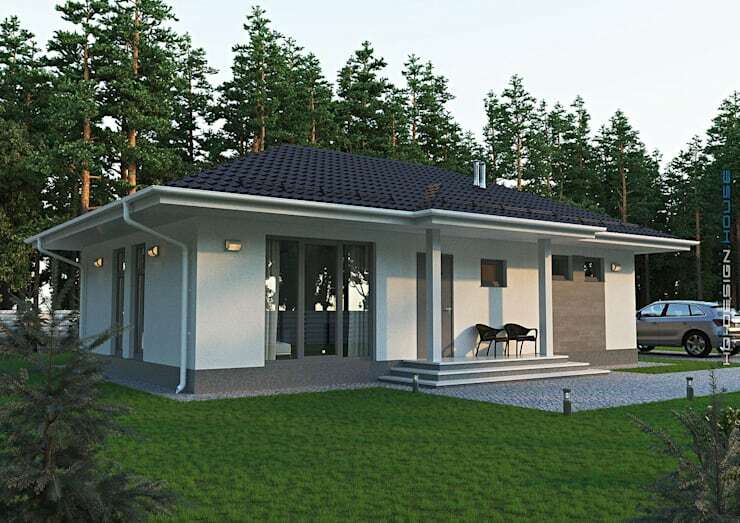 This is the main point of going for a bungalow-style house as the simple but elegant style of your home's architecture reflects that you got the best value for your money on your living space. 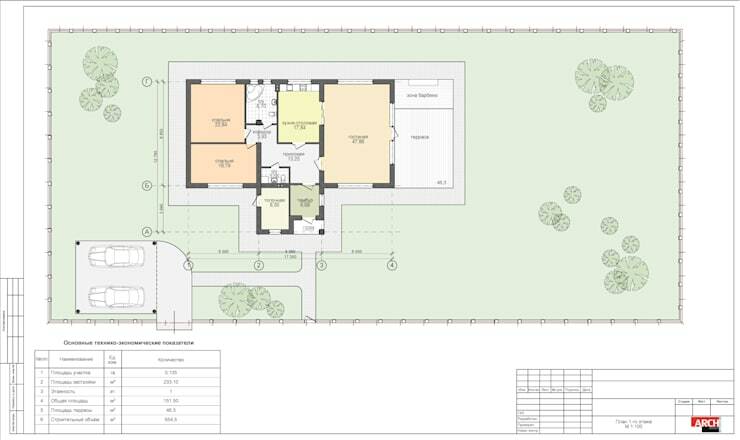 For this house plan, the fully furnished rooms are designed to be divided into individual areas, including the patio, hallway entrance, kitchen, living room, bathroom and the two bedrooms while still being conveniently connected to each other. The outdoor area is also where you can find the parking garage, which is around 20 square meters, big enough to park your car and travel with ease. The surrounding outdoor area focuses on creating a green space by decorating it with different species of perennials, shrubs and grass to add colors that express the beauty of nature. In addition, the trees provide clean air and shade, ideal for relaxation for people of all ages. This modern one-story bungalow was designed by VESCO CONSTRUCTION. The square-shaped home utilizes the strongest and most durable stone and concrete materials. The white shades of the walls are used to accentuate the home's distinctive style, making the house radiate a fresher and more comfortable vibe. The roof has panes around the eaves that serve as a rain gutter. 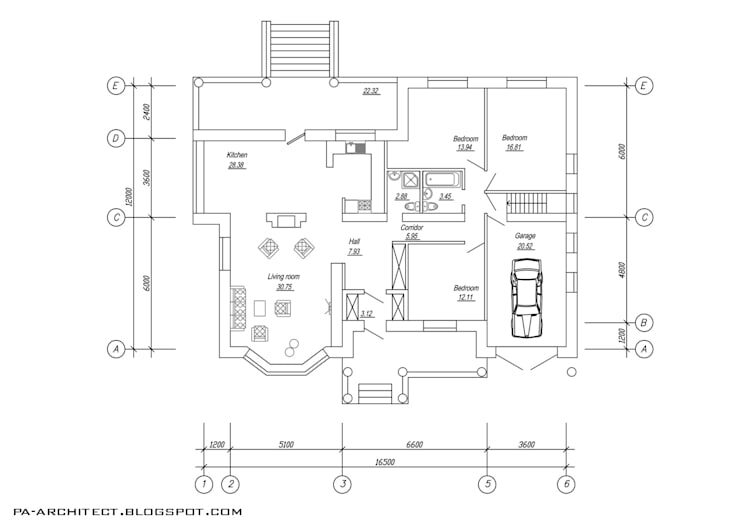 This modern home has a massive living area with 188 square meters of space with wide corners. 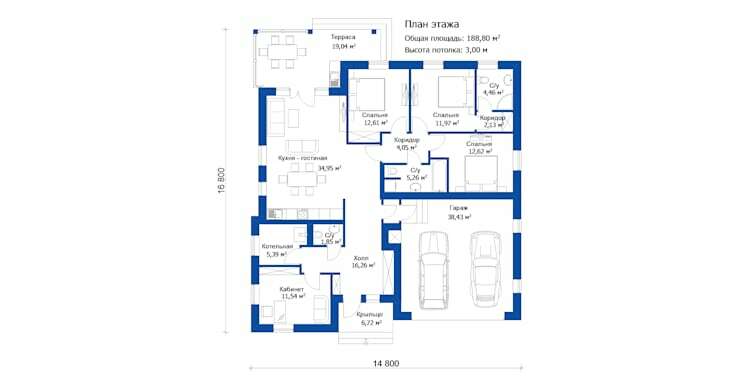 To illustrate, the central hall takes up a 34 square meter corner, but also has a corner kitchen a bathroom, and three bedrooms to ensure your family's comfort. The exterior of the house has a compact front yard, while the side has a 38 square meter garage and the rear has a dining corner for where you can entertain your guests or simply have a pleasant family meal. This beautiful rectangular home has a modest 70 square meter floor space. 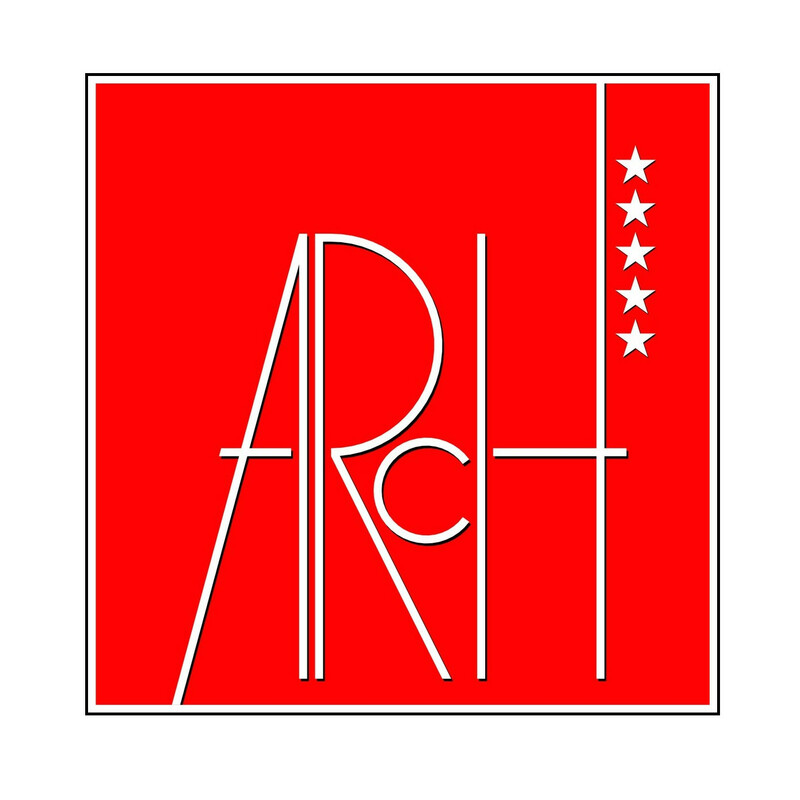 It primarily utilizes beautiful precast concrete materials which are very durable but easy to use. 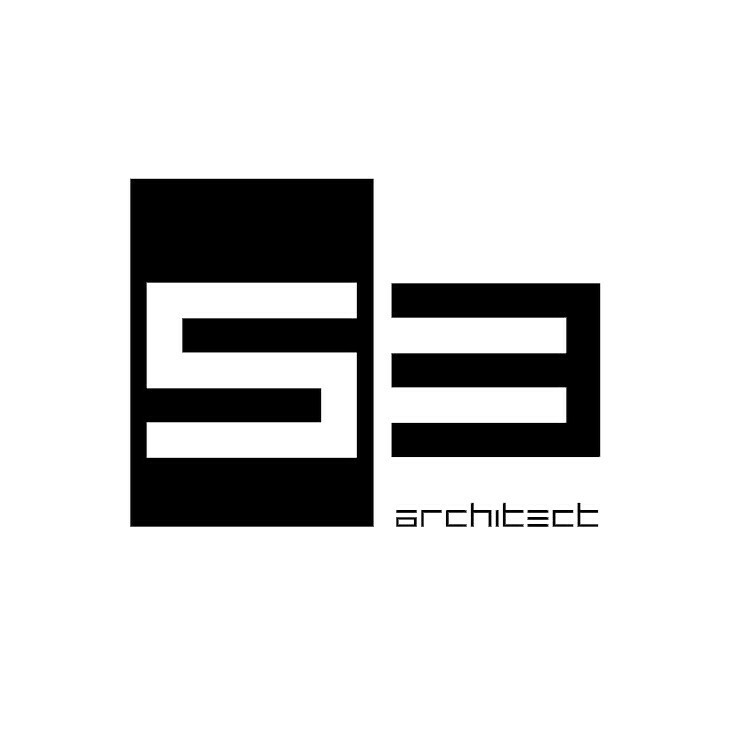 The color palette focuses on colors that emphasize comfort such as grays and whites. The roof is designed with a canopy to serve as shade and a drain for the rain. At the front of the house is a paved walkway made of stone slabs neatly placed in a pattern to serve as flooring for the home's entrance. The width of the walkway is enough to serve as parking space for a car. The outdoor area helps create a green space by decorating it with grass and other various plants to help express a relaxed and tranquil atmosphere, which is the main highlight of this bungalow. 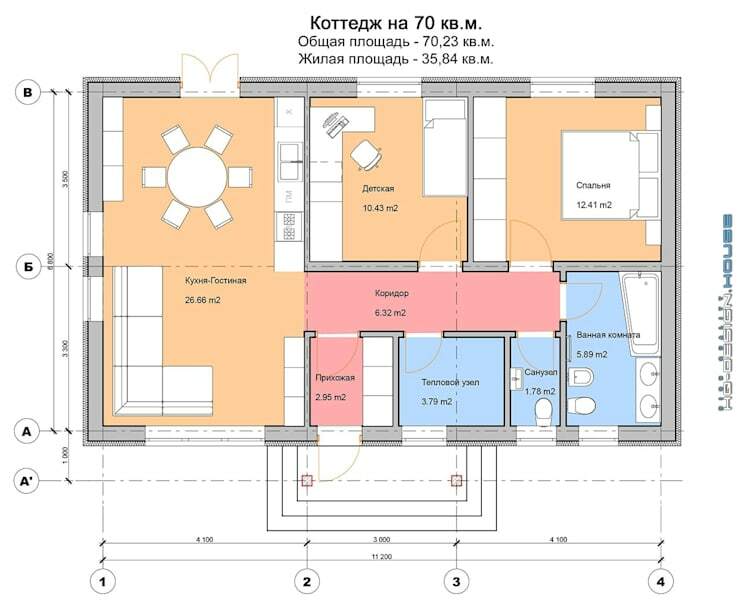 This compact 70 square meter single-storey house is divided into proportional squares. The corners consist of a living room, dining room, bedroom and a bathroom that is fully equipped with a bathtub, where you can relax and enjoy. 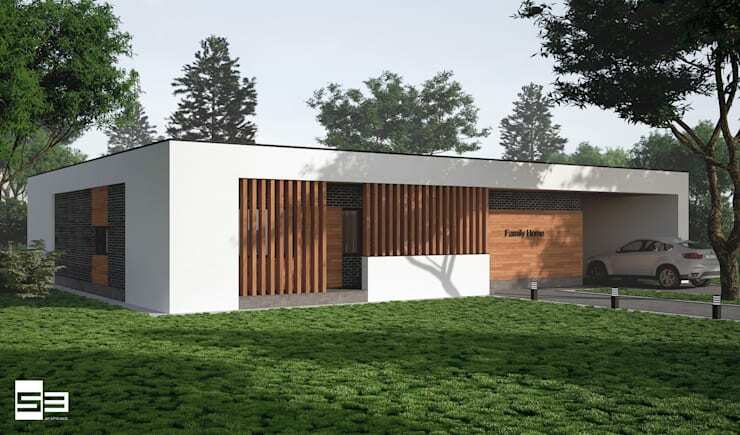 This rectangular-shaped single-storey house was designed by SBOEV3_ARCHITECT to resemble a box, giving it its smooth modern look. The main building material used is a white toned concrete, but it also features wooden snares on a slat wall as well as a beautiful brick entrance. The front exterior has a paved walkway that links the house to its surroundings. The side of the house is where the garage is located. The outdoor area is then decorated by lush green grass. 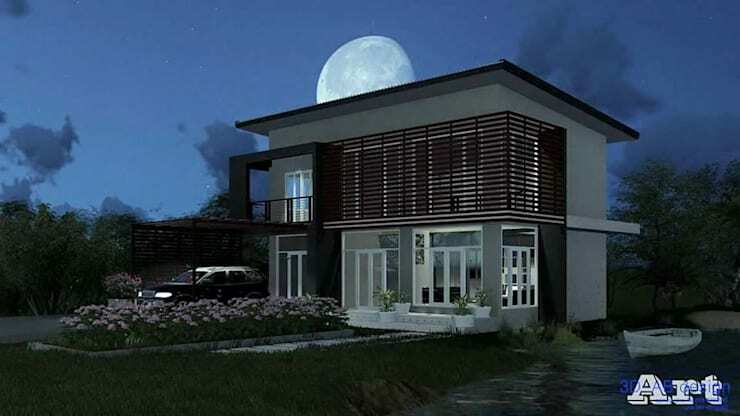 The home represents simplicity and order by utilizing minimal sloping areas, which is a beautifully modern and unique home style. The box shaped house's interior space is divided into rectangular blocks. It is fully furnished with a patio, garage, corner kitchen, dining and living area, work space and two corner bedrooms. A home ideal for relaxation, yet stylishly avante-garde. 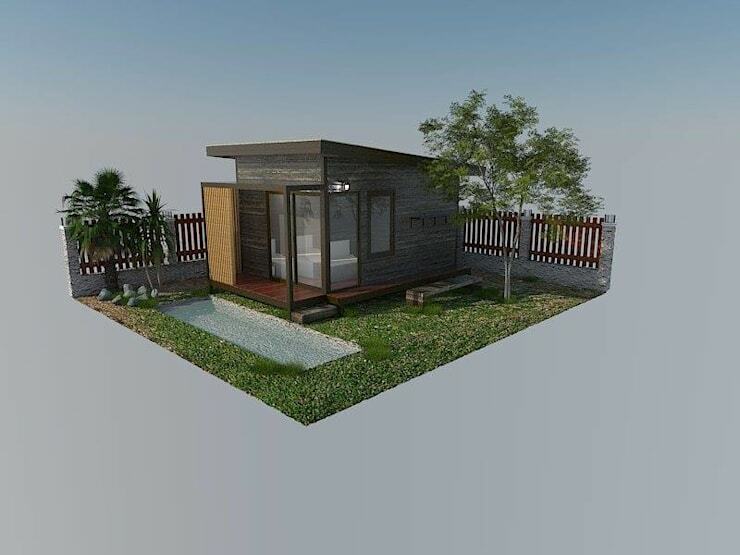 This 151-square-meter bungalow was designed by the ARCH INNOVATION GROUP. The house which built out of stone and concrete materials is shaped horizontally across the landscape, which makes the living area more spacious and the home more attractive. The color palette focuses on the simple shades of the materials. The house roof has a gable design, a distinctive contemporary architectural feature much sought after because of its elegance, lightness and ease of use. At the top of the roof is a chimney that leads to an indoor fireplace for warmth during the winter seasons. The interior of the house can be seen through the clear glass doors and windows. The home also has a vent that helps refresh the indoor air allowing to flow through smoothly bringing the atmosphere of the interior more relaxing while significantly reducing air conditioning costs. 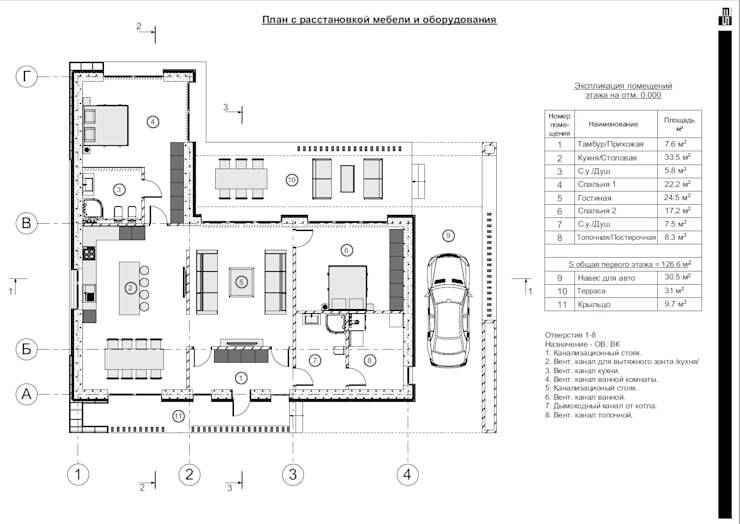 The total floor space of the house covers 151 square meters, in a rectangular shape laid horizontally. The interior of the house consists of a central hall, living room, bedroom and kitchen as well as a paved entrance walkway. The side of the house has free space to serve as a car garage which can accommodate two cars. The remaining outdoor area is designed to be green spaces to bring out the vibrant colors of nature. 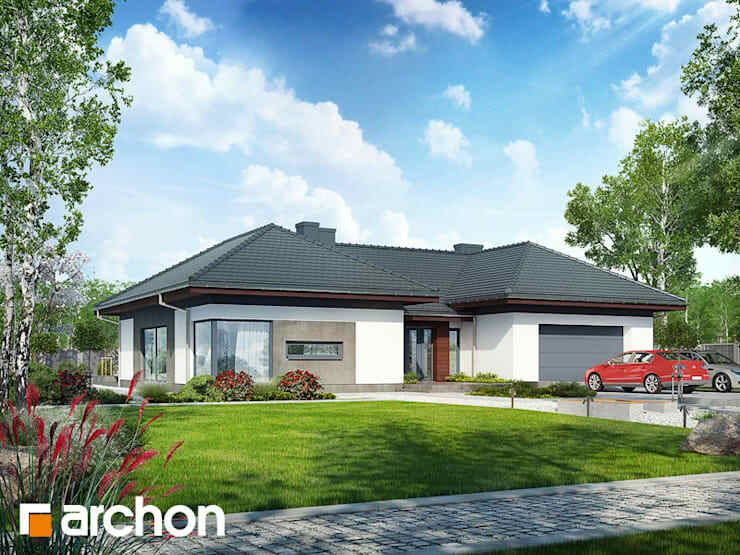 This single-storey project was designed by ARCHON + PROJEKTY DOMÓW, which focuses on a very modern design with a fully furnished living space. The main materials used for the home are concrete, wood and stone which were chosen for their beauty, durability and aesthetically pleasing colors. The color palette is focused on creating a comfortable atmosphere by utilizing white and gray color schemes paired with the natural shades of wood. The outdoor space is massive, which the designers divided with a paved walkway, garage, garden and yard which you can use to your convenience. 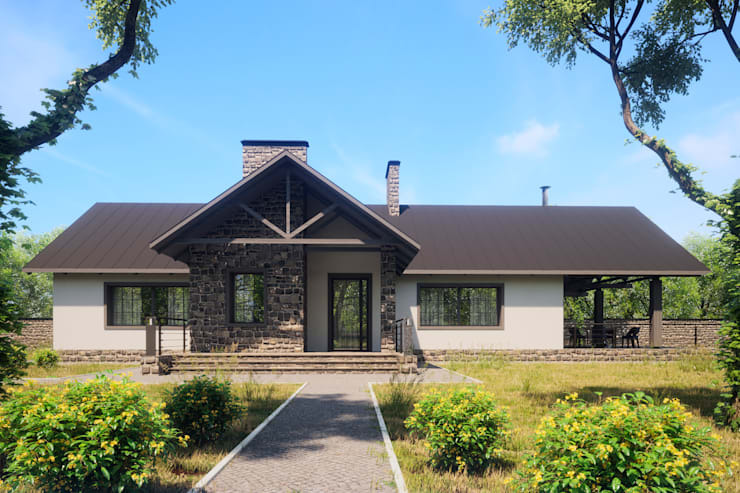 This basic, minimalist and traditional bungalow-style home is perfect for relaxation for all seasons. 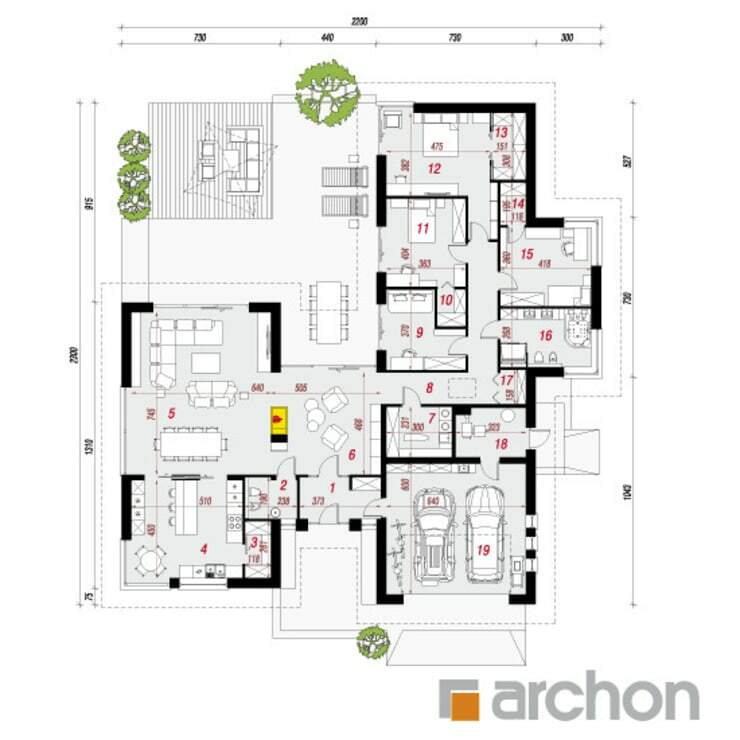 This massive bungalow is divided into the living room, corridor, hallway, kitchen, shower room, bedroom, garage, reception hall and outdoor area. Enjoy leisure activities in the lush green spaces that will bring you close to nature.